Depending on what you search for, Windows Search can either produce the result in record time, after minutes or hours of torturing the hard drives, or not at all. The native search functionality works well for certain kinds of file types and locations, but not so well when you need to find custom files. That's were specialized search tools come into play. 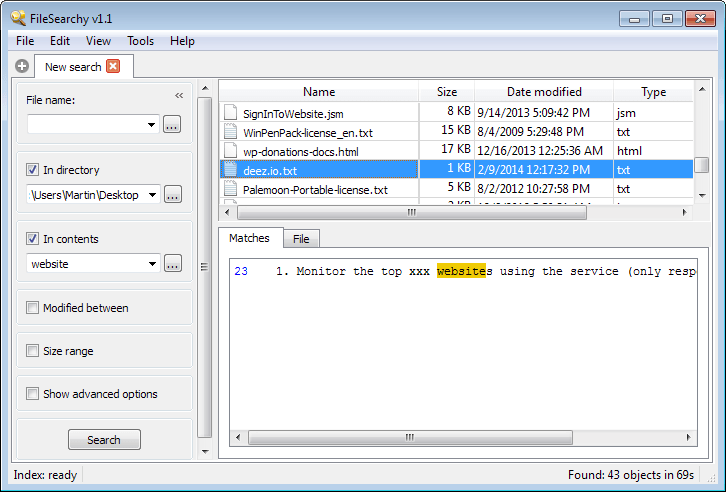 Popular programs such as Everything, Fileseek, Search My Files or Switftsearch improve Windows Search in numerous ways. Generally speaking, they find many files faster than the native Windows Search does. The programs are not identical on the other hand. Some require indexing before you may run searches (and regular updates), while others work without the need to index drive contents before you can start your searches. FileSearchy is a free search program for Windows that does not have to hide behind other programs. In fact, it ships with a couple of interesting features that makes it quite the interesting tool to try out. The program needs to be installed before it can be used. When you start it, you will notice that it supports two different search options. You can run a file name search, or search within file contents instead. The file name search works right out of the gate. Just type in the name you are looking for, or part of it, and hit the search button to get started. Results are populated instantly and you can sort them by name, size, modification date or type in the results window. It is furthermore possible to customize the search, by limiting searches to specific directories, sizes or modification dates. The program supports regular expressions which you can make use of to create advanced search queries. Files can be opened with a double-click, while a right-click displays the Windows Explorer menu for that file type which you can use for other functionality such as copying, deleting, sharing or scanning. 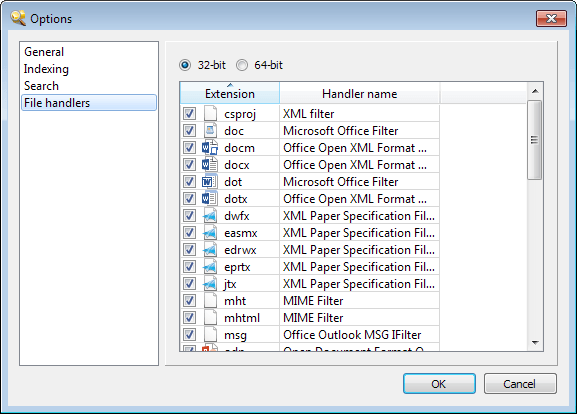 The in-contents search feature provides you with the means to find specific contents in files. A variety of file types are supported, including all Microsoft Office formats, pdf documents, HTML and other web documents, as well as all plain text types such as php or css files. This search may take a while to complete, depending on the directory structure that you have selected for the search. Results are populated while the search is still ongoing, which works well as you can go through the current results listing while the search is still being processed. If you dig deeper, you will find several other options that may help you in your searches. You can exclude file types or folders for example from the search to speed things up, enable full word search or case sensitive searches (both file names and in-contents), or disable the automatic skipping of binary files if you want those included in content searches. FileSearchy is a fast Windows Search alternative that lets you search for file names and file contents. It offers a wide range of customizations that help you perform those searches and leaves little to be desired in this regard. The in-content search works well and while it may take the program a while to display all results, especially if you search a whole drive or large directory, you can get started going through results right away as they are populated in real-time. Update: The developer website is no longer available which suggests that development of FileSearchy has been abandoned. We have uploaded the latest working version of the program to our own server. Looks like I should try this search tool. Today I searched for a file with both Copernic Desktop Search, and Agent Ransack. Neither of them could find it. But then I found it by just looking in a File Manager. My odd filename – contained symbols ‘(‘, ‘)’ and ‘;’ but that shouldn’t have been a problem. I use Everything and Swiftsearch. Both portable. For instantaneous search and a file handling companion with many features Listary is excellent. I’m using the free beta portable version. The author is active and very helpful. FileSearchy looks interesting because it seems to have real-time search+indexing ability. It can make use of both 32-bit and 64-bit IFilters installed on the system. But it doesn’t seem to make use of property handlers to search metadata. You know Microsoft screwed up the search function in Windows when quite a few people are using third party search software instead of the built-in search. It’s been so long since they screwed it up I can’t even remember when it was. Vista maybe? And they’ve continued to make it worse ever since. Even on Win 8.1, the Start Screen search is now slower than it was on Win 8.0. Wise Search is good and it is fast. Unique in that you can keep it ready but hidden. I used SearchGT for years. I loved it because it worked just like using MS search in Windows Explorer. Then one day, it quit working, and the company ignored my pleas for help. I then tried several different search applications. I settled on Xs Search, but then I discovered FileSearchy. It is very fast, and it’s easy to use, but on my system, it will not launch from Explorer. Clicking on Search with FileSearchy does not bring up the app. And when I use it, if I let it sit in the system tray, it pops up a warning that says it is still running, and then starts eating CPU. Still, it’s the best searcher that I’ve found, so I’m going to keep it and shut it down after every search . . . but I sure miss SearchGT. …and there are multiple ways of doing both. The best and fastest way of doing the first one, which usually requires either no database, or only a small database of pointers but not actual filenames or even folder structures, is the kind that uses the NTFS Master File Table, which is an index of all files and folders constantly maintained by Windows, itself, for its own purposes; and so any file searcher which taps into that may generally not be bothered to maintain its own database, and can also find files in fractions of a second, just like Windows, itself, can do. The “Everything” file searcher by VoidTools uses that methodology; and I suspect so is the just-filenames search part of FileSearchy. The whole business of searching for content (text strings) within files, though, is slow, no matter what app tries it. There are, indeed, various algorithms for it, some better than others. One thing that’s nice about FileSearchy is that the files that are looked-in for the sought-after text string can be specified; and by narrowing the search like it, it can speed said search a lot. Not a criticism. Just a helpful correction. Same for “software”. “Software is” not “softwares are.” “Software is a singular noun defining a category of product. Rude of you, and very irritating, and has no business on this website. Are you proficient in any language other than trollspeak? KALMLY WROTE: Rude of you, and very irritating, and has no business on this website. Are you proficient in any language other than trollspeak? MY RESPONSE: Oh, give it a rest. And go look-up “troll” so you’re clear on precisely what it is. q.’s comments are dead-on. Those of us who actually have respect for the English language, and who have been actually paid in life to use it properly, find the misuse of it — particularly as much of it as is going on these days — to be particularly irritating. q. was clear that it wasn’t an overall criticism; and that the writer does very well considering that English is his second language: with both of which things I could not more strongly agree. q. also suggested yet a third metaphor: “out of the box.” I was thinking “out of the gate” as well as “off the bat.” And I even wrote, privately, to Martin, and talked about how difficult it is for even native English speakers to get the idioms right; and to not mix metaphors. That’s all that happened, here: a simple metaphor mixing. Every native English speaker has done it, and it’s no big deal. But that doesn’t mean that those who deign to use English metaphors — regardless what is their native language — shouldn’t endeavor to get them right. I’m sorry, kalmly, that someone so corrected you in life — likely as a child — that you now cannot tolerate it. Shame on whomever that was for not making it a more constructive, encouraging learning experience. But please do not inflict your sensitivities on everyone else. It’s not our problem that you can’t tolerate a valid criticism/correction. If it’s that big of a problem, then perhaps you and whomever ruined you for correction/criticism should get some joint counseling, because it’s clearly very easy to trigger your sensitivity. As a user speaking a non-Latin-alphabet language I am always concerned about encoding support for file searching and indexing programs. Not sure how this program handles non-ASCII charaters and characters from non-zero Unicode planes. How about a search tool that can search your entire home network? I had one a long time ago but it became unsupported after a few years. Would like it to search home server and other computers on my network basically. One has to make sure that FileSearchy does NOT index any HDD (see options) ’cause one’s Skyrim or any other game will stutter to a crawl and CRASH withing 20 to 70 seconds, even with 8+MB of RAM ! Be warned, dudes and dudettes. Besides that, it’s well worth the (momentary) use compared to Everything and, say, o2find to search files and/or contents… although it uses more memory that those two combined… and it does work FAST on a 64-bit system, hence thus therefoe my saying ‘momentary’ use, ie. no need to let it run in the background.